Discussion in 'Classic Menswear' started by voxsartoria, Feb 18, 2009. "I want love and affection, not the house of correction!" Q'uest ce que vous chantez? Nous chantons les rouges aller! a true man's man. Sadly, very few of those kinds of iconic male figures any more. I'd argue there were few then. By their very nature, iconic should mean rare. Cool popover. I think everybody has an angle on their face that when photographed they look cool. Somehow, for Mcqueen every angle was that angle, without him ever looking pretty or like a model. 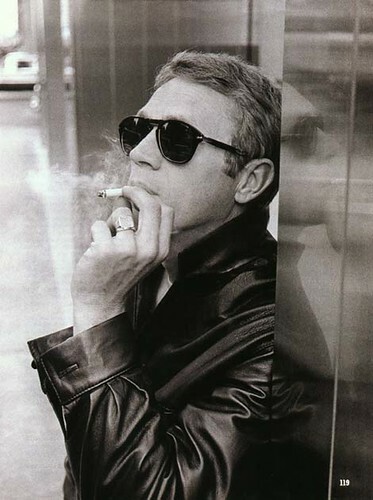 Every picture of Mcqueen looks like a great picture of an average guy, the best picture that guy ever took. I know it is sacrilege, but I'm not all that impressed. The suit he's wearing in front of the Rolls Royce is just plain bad. True, tailored clothing wasn't his strong point. Besides, could anyone possibly be cooler? What makes DC astonishingly ill-dressed is in its pretention of gravitas, its self-importance and its propensity for getting it all wrong. The suit in front of the Rolls is from Thomas Crown.